As vehicle manufacturers constantly attempt to outdo one another in convenience, comfort and safety, new features appear on premium models and then gradually trickle down to the mainstream models. While automotive manufacturers sometimes develop their own systems, many of the advances in safety such as anti-lock brakes or electronic stability control are developed by companies like Bosch and licenced to vehicle manufacturers who pay per installation. At the moment companies are essentially bridging the gap between where we are now in terms of vehicle safety under difficult circumstances and where we’ll be in only a few short years when fully autonomous cars will be available to the public. 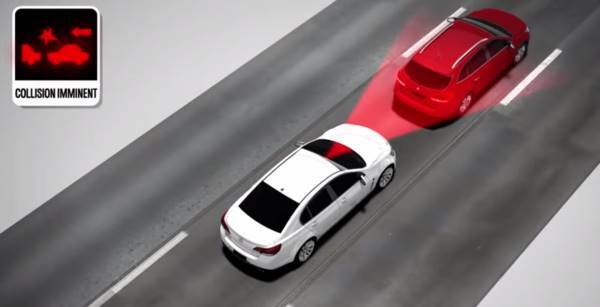 The system uses a video camera and radar sensors in the front of the car to constantly monitor the distance to the vehicle in front. If this begins to close rapidly and the driver appears to be taking no action the system will prepare the brakes and will give an audible or tactile warning (e.g. a beep and a vibration of the steering wheel). If the driver still takes no action the vehicle will begin to apply braking measures by changing down one or more gears and applying the brakes. When the driver actually does brake, the vehicle will apply extra pressure if needed. Predictive emergency braking won’t guarantee that you will avoid an accident, but it will do its best to minimise the effects of an accident. There are usually two stages: a city mode that’s active at city speeds (e.g. under 30-50kph) which will automatically brake if a pedestrian steps out in front of you, or if you are about to have a minor nose-to-tail accident), and a highway mode that is active at higher speeds where you will also get the audible and tactile warnings that there wouldn’t necessarily be time for in the city. Some insurance companies in Europe and Scandinavia offer discounts if a vehicle is fitted with predictive emergency braking because it dramatically reduces the likelihood of minor fender-bender accidents. Holden’s system doesn’t do the braking for you, but does warn you, and starts to prepare for your braking by moving the brake pads closer to the brake discs. If you are in a situation where you have to quickly turn to make an evasive manoeuvre, a high-sided vehicle can roll, and rolls cause a disproportionate amount of fatalities. Roll-over Mitigation uses the existing electronic stability control system to automatically brake individual wheels to keep the vehicle upright. It monitors the lateral force on each tyre to determine what kind of chance there is of the vehicle tipping over. Trailers, especially high-sided ones, are susceptible to cross winds and turbulence from other vehicles. This can cause them to start swaying. The oscillations can get more an more violent and are usually only able to be controlled by slowing the vehicle down gradually. Sometimes it’s too late to do that, though, and the driver’s input tend to exacerbate the situation. Speed can also cause a trailer to sway if it hits a bump that loads one side and starts a swinging motion. The system using the existing electronic stability control to brake individual wheels to counteract the trailer swaying. If your vehicle doesn’t have trailer sway mitigation the best way to avoid it is to keep your speed down and try to avoid driving with a trailer in strong winds. Unladen utes (which have very little weight over the rear) are at high risk in a trailer swaying incident. When you do have to brake, the energy generated by the brake pads on the discs is wasted as heat. Regenerative braking uses a generator to capture kinetic energy. This can be used to replenish batteries for hybrid vehicles, or vehicles that have a separate battery to power systems such as power steering and air conditioning as not to take power from the engine to operate them. With today’s cars getting ever bigger and with small rear windows and thick rear pillars to improve crash protection, parking is becoming harder. Automatic parking uses sensors on the sides of the car to scan for a space big enough to park in. Once it’s alerted you to a space all you need to do is put the car in gear and adjust the throttle. The car will steer itself into the parking space. While automated parallel parking has been available for a few years, right-angle parking is not so common. If you are driving a large vehicle or one with large blind spots such as an SUV, having an all around view can help with manouevring in tight spaces. Cameras with fish-eye lenses are mounted underneath the wing mirrors, and on the front and back and their image is processed and stitched together to form a surround view of the car that mimics a camera that is above the car. This can be very confusing to people if they don’t know how it works. Hill Start Assist has also been available for a few years and is now becoming mainstream. If you are parked facing uphill, as you release the brake gravity wants to drag the car backwards; this is particularly pronounced if your car is heavily laden or if you are pulling a trailer. Hill start assist (sometimes called Hill Hold) keeps the brakes on for a predetermined amount of time after you’ve released the brake (usually around two seconds), and waits until it detects you have applied enough acceleration to pull away. Internet-connected cars come in two flavours: those that have a built-in SIM card and can connect themselves to the internet, and those that connect via your phone using a specific app. Expect to see much deeper integration of apps and custom dashboards coming to cars over the next few years. At the moment you can do things like stream radio, have it read text messages, integrate with your phone’s sat nav and so on.